Our latest addition to the “Author Tools” menu brings your accomplishments home! 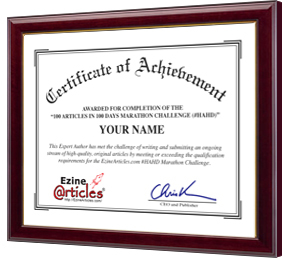 If you qualified for the first #HAHD Marathon Challenge you can now print this great looking Certificate of Achievement right in the comfort of your home or office. Use the best computer printer you have available – the better the printer, the better the print! The “Accomplishments” page will be a permanent addition to every member’s account. Anytime there are accomplishments to be celebrated, this is where you’ll find them. It’s also where you’ll find information on other contests, competitions or challenges you may want to check out. You may have also noticed a message on your home page that reads “You’ve completed the 100 Articles in 100 Days Marathon Challenge! Download your certificate now.” Clicking on this link will take you right to the “Accomplishments” page. Clicking on the x will permanently remove the message. Like all new additions to the EzineArticles.com website, we want to be sure it’s working right and exceeding your expectations. Leave a comment to let us know if we missed the mark on either of those items. I downloaded my certificate when I submitted another article. Very cool! I plan to frame it and hang it with my other writing achievements. It’s always great to get a pat on the back. Thanks Chris. Thanks that is very cool! I wonder if it might not be a good idea to post a star or some little EA-HAHD icon besides the authors name as another bonus? Squidoo does that when you have a certain amount of lenses, you get a Giant Squid icon besides your name. They have other ways of getting more icons for various reasons. People will do a lot for a star~! Hummm? If you look at the Author Name (the “by-line”) on any article written by a Platinum level member, you will see a little gold star indicating their Platinum status. This star indicates to the reader that the author has passed the article standards necessary to achieve that level. A little mug! Darn cute! Maybe the stars, etc. should show up within the authors profile too? Another excellent idea – Thanks! How did I miss this awesome contest? I love getting stars….can I sit in the front of the class too? I like Kathy’s fabulous idea. I also converted a copy of mine to .jpg to place on my website credentials. Ohh hey Lisa, very cool idea. Maybe EzineArticles should create small ones for people to post on their sites for those who are not going to go through the paces to make the certificate smaller. I really do like the cutie little mug idea. I used Photoshop (or GIMP is free alternative) to convert mine from .pdf to .jpg and then resize it to multiple sizes appropriate for my website. It’s a pretty simple process even if you’re not familiar with those editing programs. This is really a great challenge. I hope to make it by November 8 or before. Fantastic ideas. I prefer it. Thanks for taking such a great step. BTW Thanks for the Challenge… It made me step up my game a little! Lance Winslow (that’s me) would like to hereby declare that he has completed his 18,000 th article at EzineArticles.com and was about to do this 4-days before his projected target date of September 1, 2009. Lance Winslow (that’s me again) is now considering taking Friday off as a reward. Ohhhh man! Lance WOW! CONGRATS! Yes, I would say you are due a day off. Confirmed that Lance has 27 articles in queue and most likely by Friday, we’ll be showing he has 18k articles listed. Congrats on reaching this milestone…and more importantly, doing it without cheating or using article rewriting software or other short-cut quality-dropping aids. Hot damn (can I say that here?) Lance. I think congratulations and a day off is in order. Awesome job, Lance! Very good work. The day off is definitely due. Here’s hoping it’s a good one! Great work Lance. We who write know how much work this took. Kudos to you!! When can I participate in the next HAHD challenge? May I recommend that you make participation an on-going process, i.e., one can start on any day? You CAN start on any day. As a matter of fact, any published articles you submitted on or after August 1 already count toward the 100 article total. We’re only 28 days into the challenge, so you’ve got plenty of time to catch up if you’re behind. No sign up is necessary to qualify, but you need to submit the email to hahd@EzineArticles.com to claim any prizes. Is Lance one of the most prolific writers of all time?!!! No…Lance is just one of the best of the best!!! As Marc said that any article written from August 1st can qualify for the HAHD. Are you talking about 2nd Marathon Marc? Does that mean that even I can participate? I was thinking I missed this one but if the contest is on then maybe I can step up my game. I surely love to receive achievement goodies from EzineArticles. I’m sorry to say, both HAHD challenges are finished. Watch for the 3rd one in January!